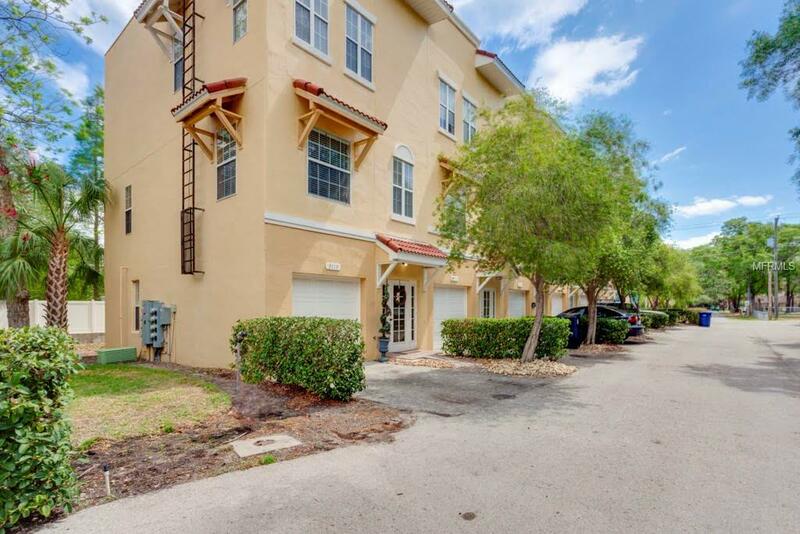 Come see this gorgeous Spanish style townhome conveniently located in South Tampa. This Mediterranean style villa is an end unit and no neighboring building directly in front. Built in 2003, this home consists of 3 floors with 3 bedrooms 2 full baths and 2 half baths and a 1-car garage. Upon entering you will be greeted with a nice foyer with stairs to the second level and a hallway leading to a 1/2 bath, garage, washer and dryer, and a nice size bedroom with a closet and sliding glass doors that lead to your very own private deck and backyard; excellent for grilling and entertaining. The main living area on the second floor has lots of windows with copious amounts of natural light (major bonus being an end unit). The beautiful oak finished hardwood floors flow through the living and dining room. The kitchen is open and spacious with solid oak cabinetry, dark appliances, and granite counter-tops. Whats better than one master-suite? How about two?! Each with its own bathroom and walk in closet (located on the third floor). 3113 Santorini Villa is close to Bayshore and all your favorite South Tampa hot spots. Perfectly placed, private, and pending your arrival.